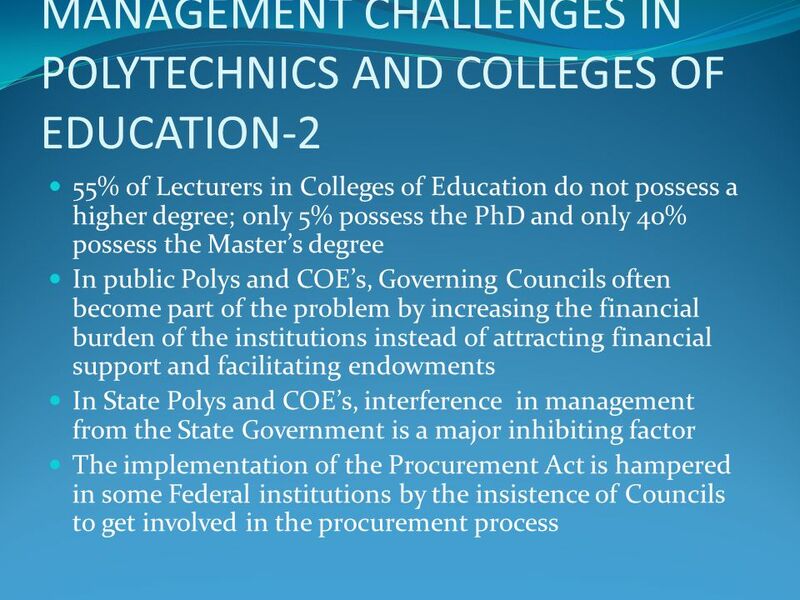 3 ABSTRACT-2 The funding challenges across all institutions and regardless of proprietor are similar but differ in degree. 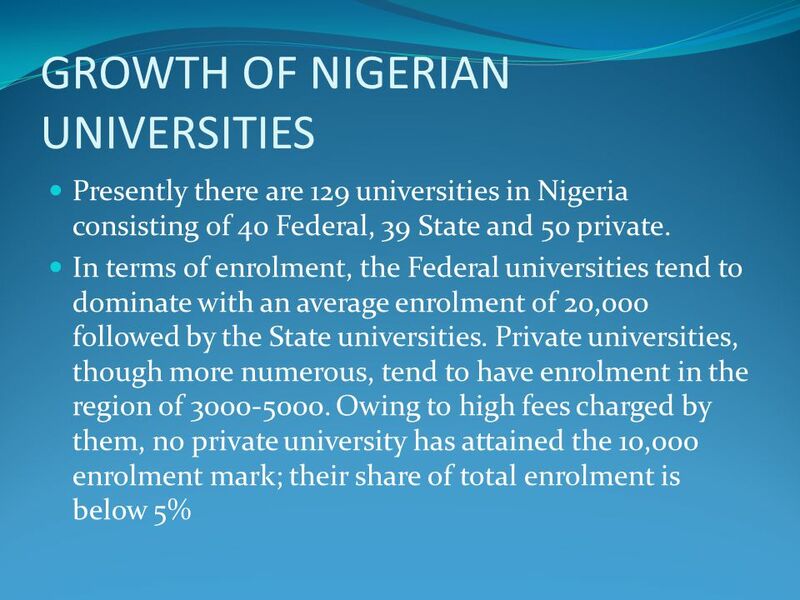 All the tertiary institutions tend to be chronically under-funded but the Federal institutions and top-of the-range private institutions tend to be relatively well resourced. 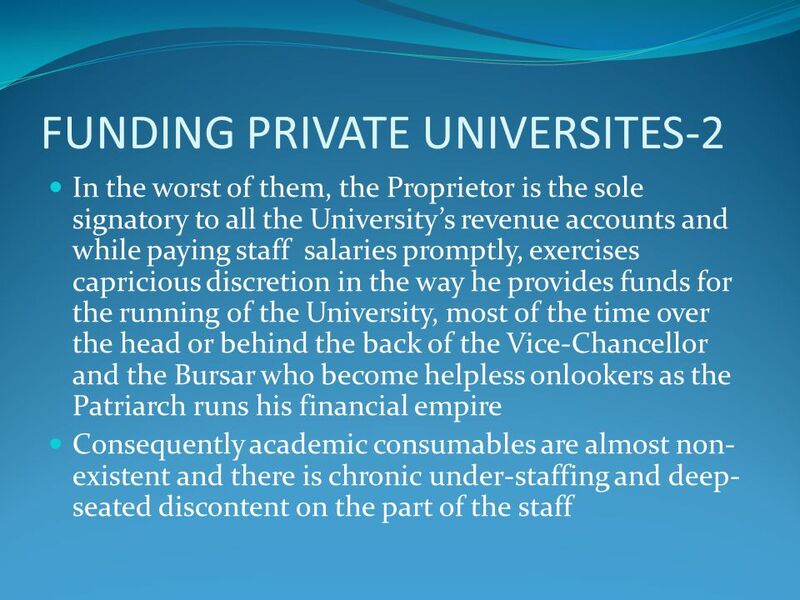 The least resourced institutions tend to be State Government-owned and the struggling private institutions where the profit motive is paramount. 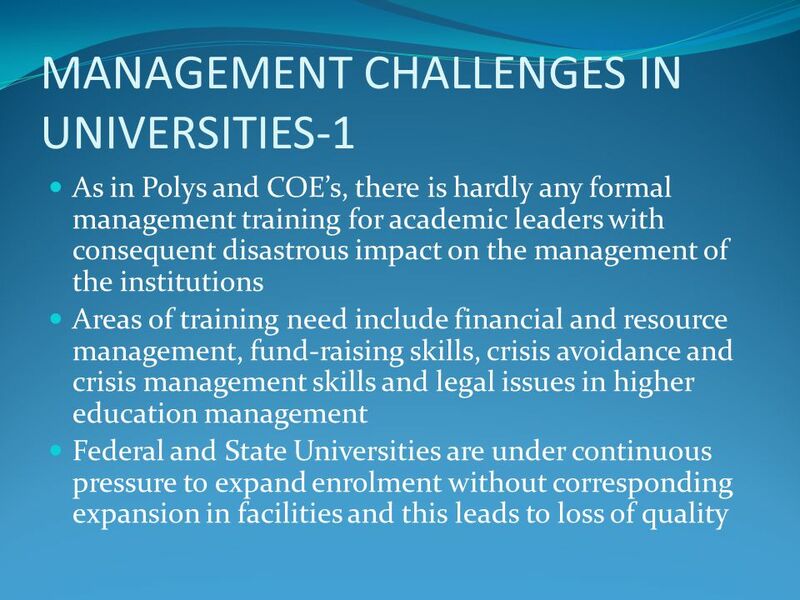 13 MANAGEMENT CHALLENGES IN UNIVERSITIES-4 Quality is low generally, especially when Nigerian universities are benchmarked against the gold standard in international rankings. 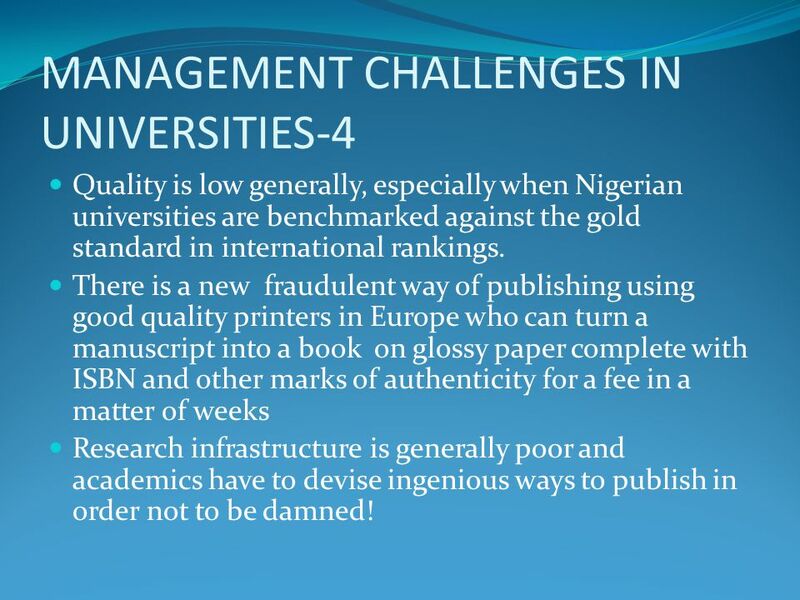 There is a new fraudulent way of publishing using good quality printers in Europe who can turn a manuscript into a book on glossy paper complete with ISBN and other marks of authenticity for a fee in a matter of weeks Research infrastructure is generally poor and academics have to devise ingenious ways to publish in order not to be damned! 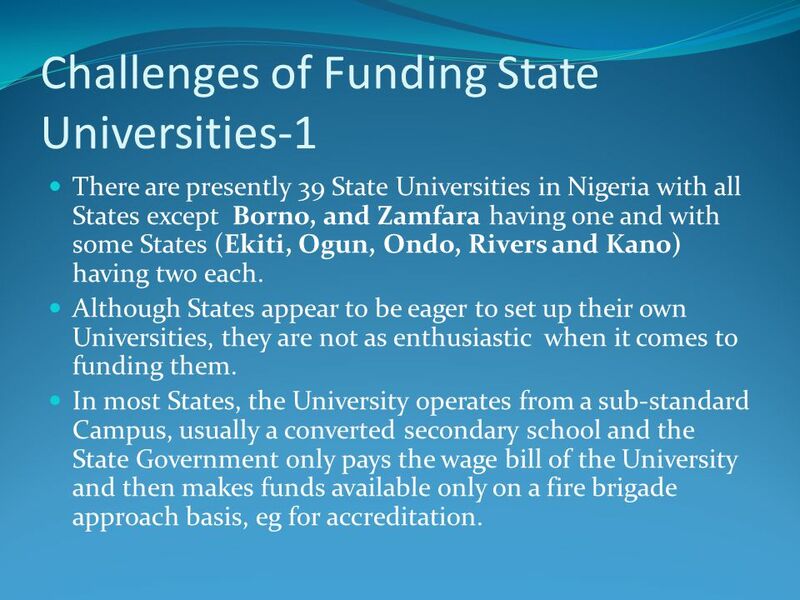 26 Challenges of Funding State Universities-1 There are presently 39 State Universities in Nigeria with all States except Borno, and Zamfara having one and with some States (Ekiti, Ogun, Ondo, Rivers and Kano) having two each. 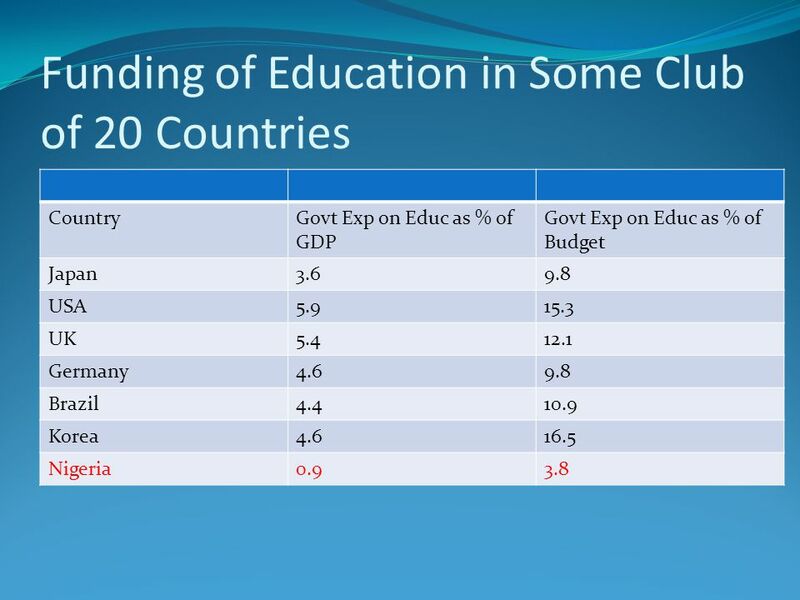 Although States appear to be eager to set up their own Universities, they are not as enthusiastic when it comes to funding them. 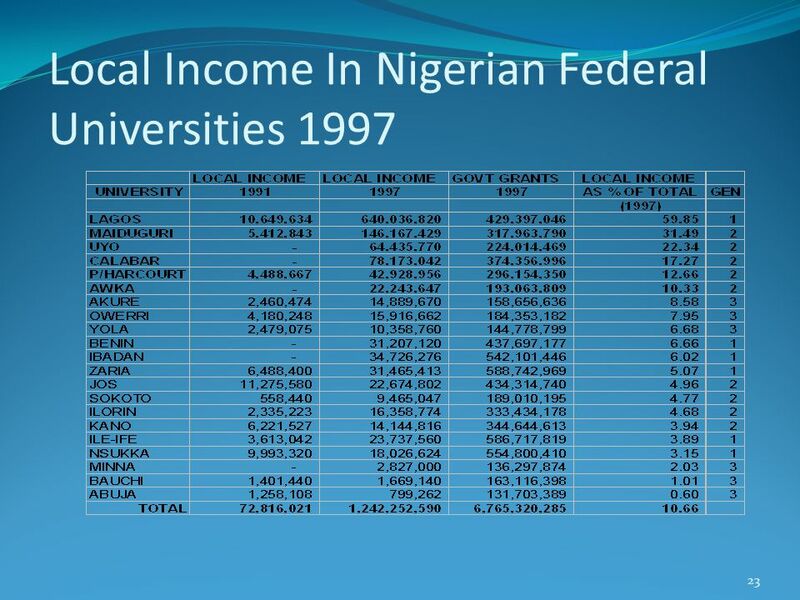 In most States, the University operates from a sub-standard Campus, usually a converted secondary school and the State Government only pays the wage bill of the University and then makes funds available only on a fire brigade approach basis, eg for accreditation. 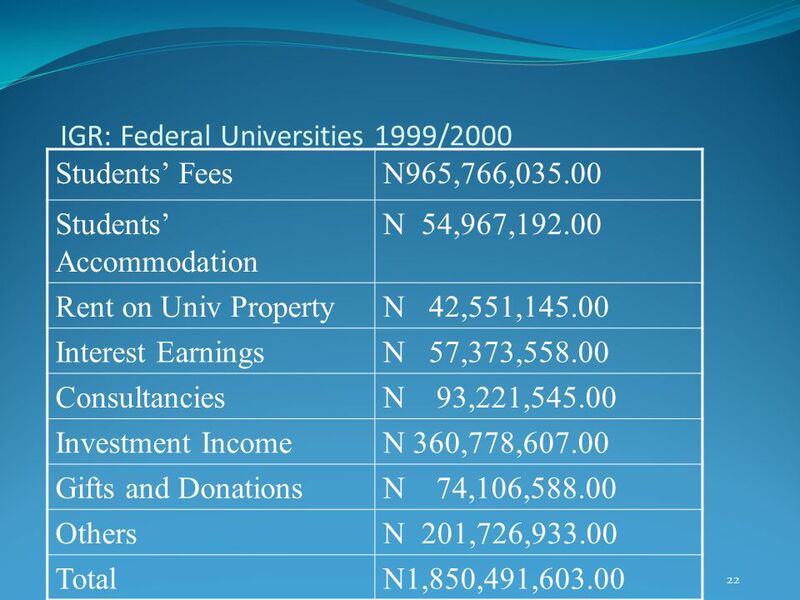 27 Challenges of Funding State Unviersities-2 Consequently, the University often has to resort to self-help to survive, leading to the charging of illegal fees, lack of transparency in financial management and academic corruption on the part of academic staff State Universities consistently fall behind Federal Universities in terms of funding and performance in accreditation. 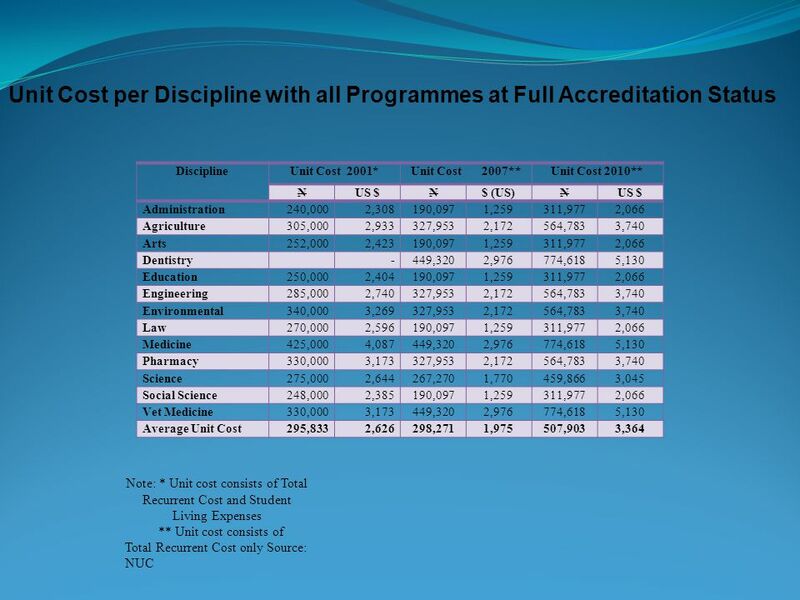 Indeed, overall, even Private Universities appear to be better off in accreditation performance than State Universities, and this is directly traceable to the State Universities’ poorer resource base. 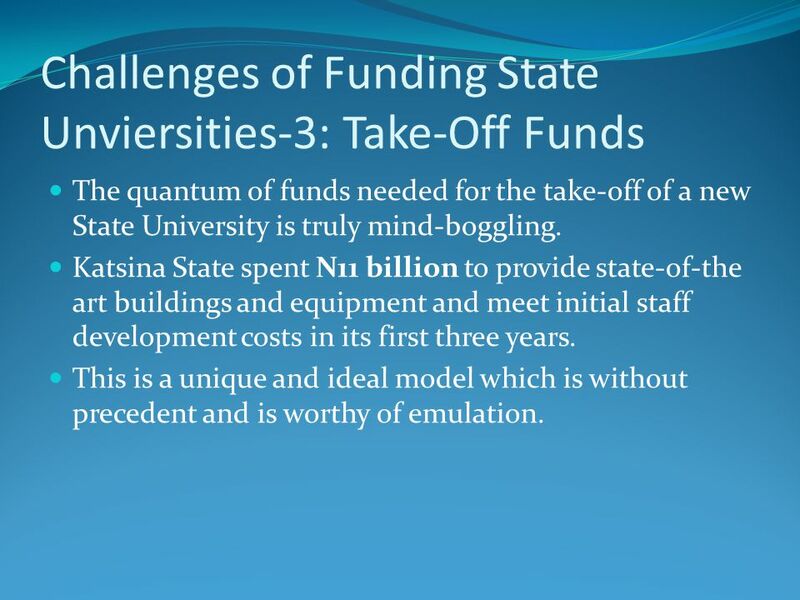 28 Challenges of Funding State Unviersities-3: Take-Off Funds The quantum of funds needed for the take-off of a new State University is truly mind-boggling. 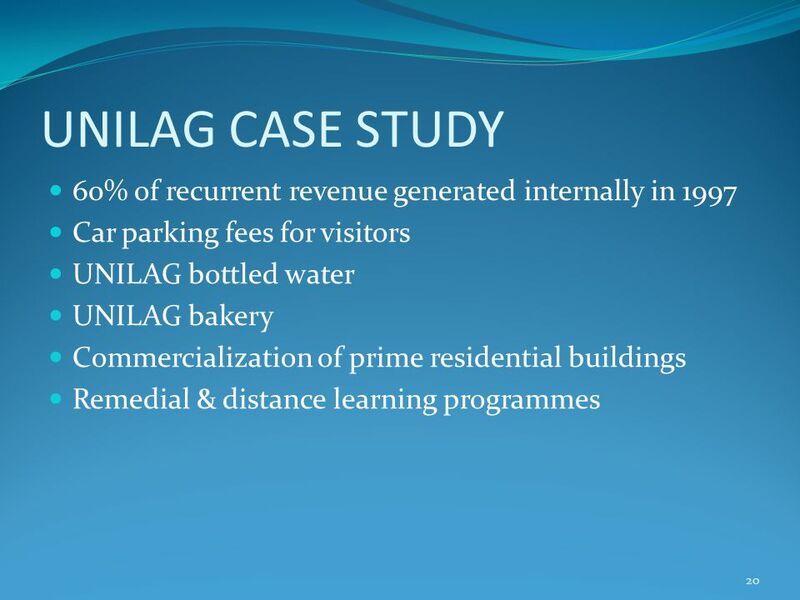 Katsina State spent N11 billion to provide state-of-the art buildings and equipment and meet initial staff development costs in its first three years. 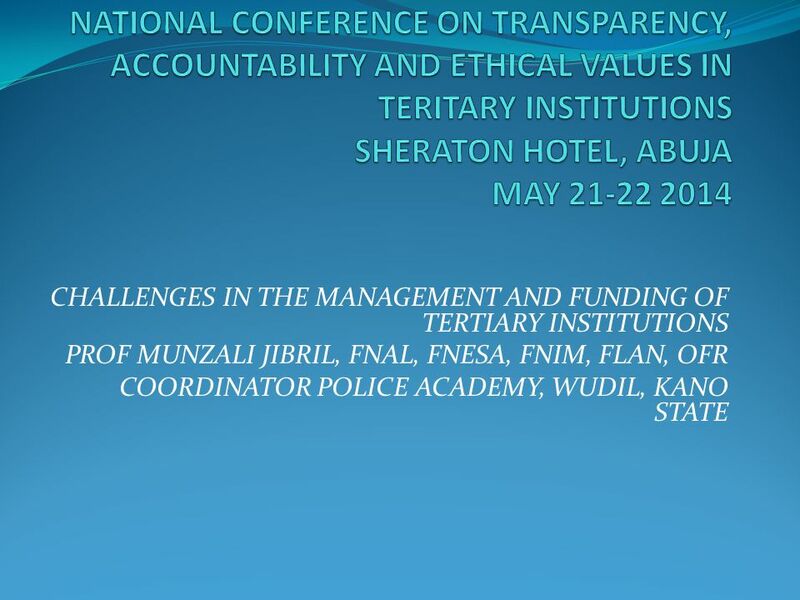 This is a unique and ideal model which is without precedent and is worthy of emulation. 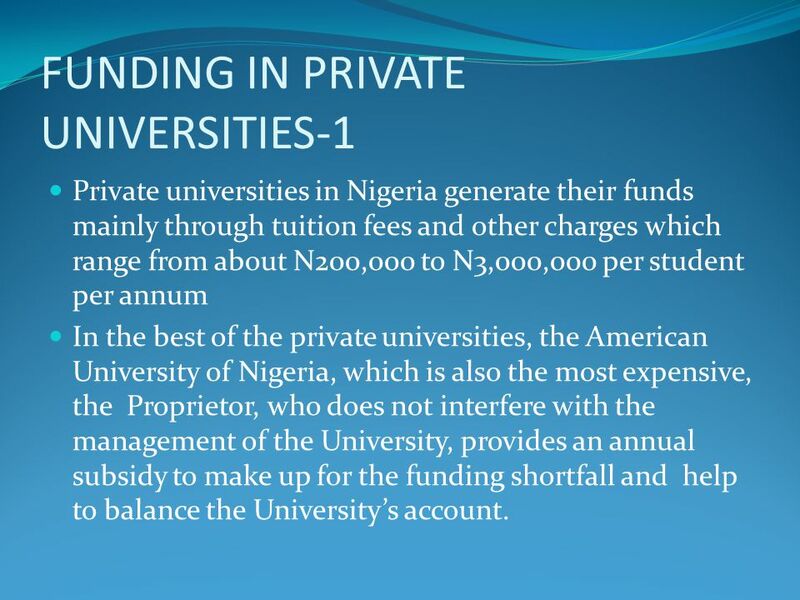 30 FUNDING IN PRIVATE UNIVERSITIES-1 Private universities in Nigeria generate their funds mainly through tuition fees and other charges which range from about N200,000 to N3,000,000 per student per annum In the best of the private universities, the American University of Nigeria, which is also the most expensive, the Proprietor, who does not interfere with the management of the University, provides an annual subsidy to make up for the funding shortfall and help to balance the University’s account. 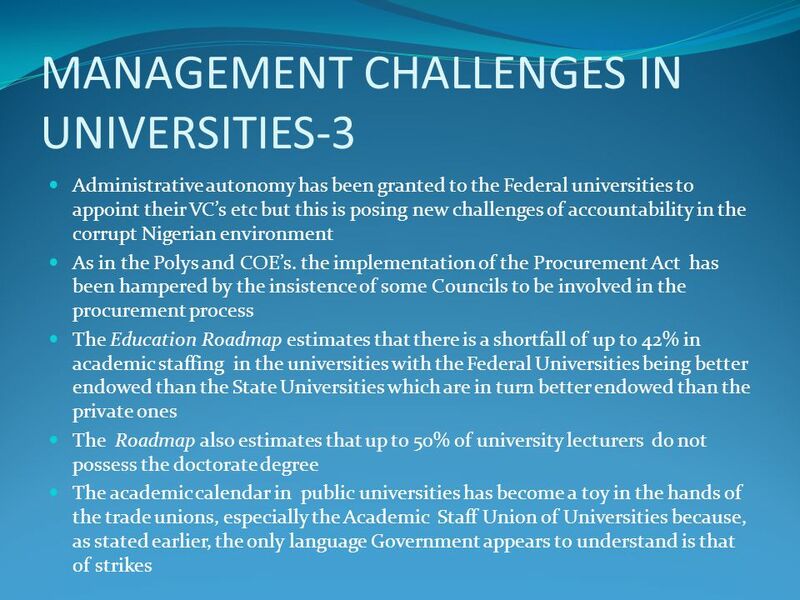 33 Conclusion-2 Management training should be institutionalized for academic leaders in the tertiary institutions. 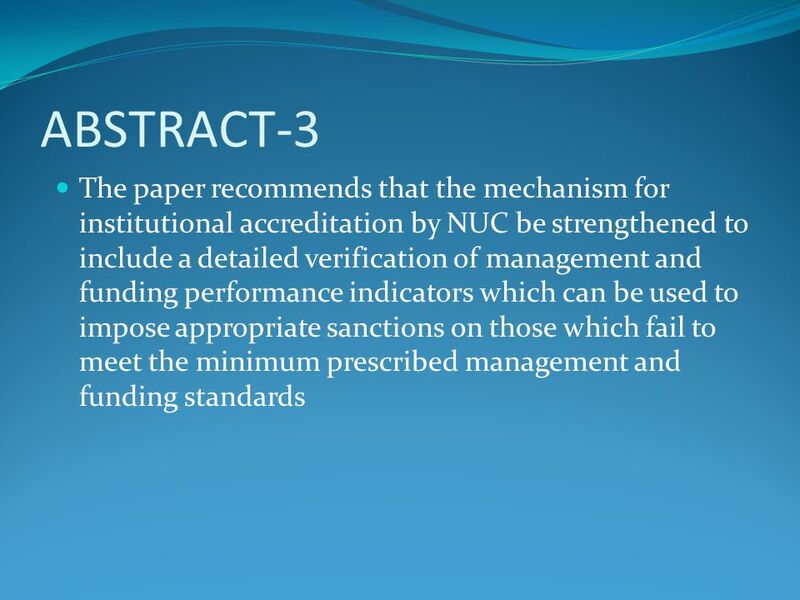 Tuition fees should be re-introduced in Federal universities along with appropriate safety nets to protect the vulnerable In view of some of the anomalies highlighted in this presentation, the mechanism for institutional accreditation by NUC should be strengthened to include a detailed verification of management and funding performance indicators which can be used to impose appropriate sanctions on those which fail to meet the minimum prescribed management and funding standards. 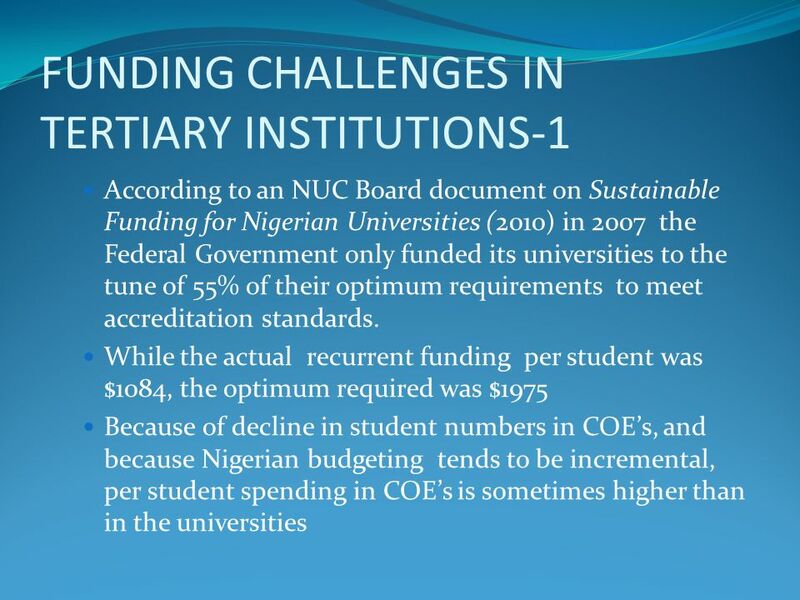 Download ppt "CHALLENGES IN THE MANAGEMENT AND FUNDING OF TERTIARY INSTITUTIONS PROF MUNZALI JIBRIL, FNAL, FNESA, FNIM, FLAN, OFR COORDINATOR POLICE ACADEMY, WUDIL,"
The 2006 California Budget and Legislation Impacting Latino Students. Reforming Pell: New Ideas and Research to Improve Student Aid Policy Mark Kantrowitz Publisher of Fastweb and FinAid December 8, 2011.
Credit Cards 101. Shopping for A Credit Card Comparison shop credit cards Dont take the first offer that comes to you: –Pre-approval Means nothing No. 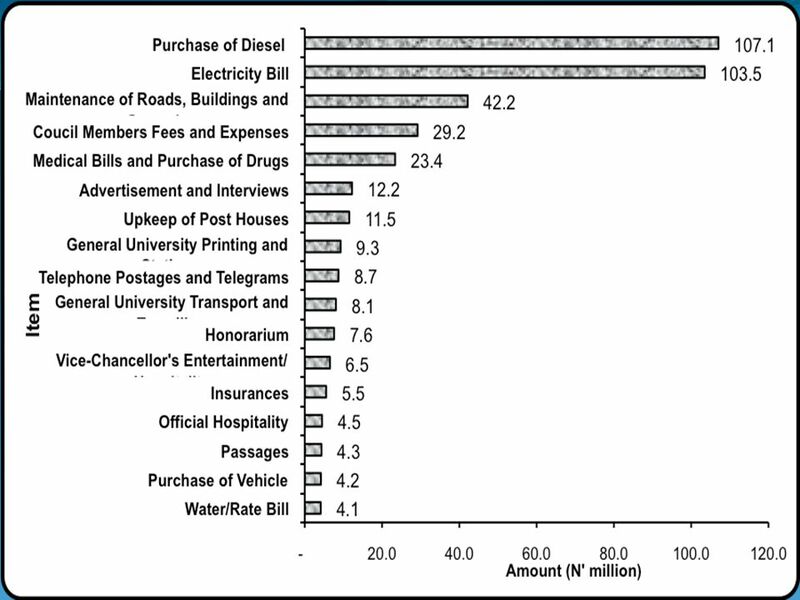 PSU Social Enterprise Magic Bus India Sustainability Part Five. 1 Budget Forum Wednesday, June 2, © 2010 Florida International University 2 FLORIDA INTERNATIONAL UNIVERSITY Budget Forum AGENDA Education & General. Texas Regional Ad Astra Summit Benchmarking, Metrics, Comparative Metrics Getting the most out of your resources 7/09/12 Presented by: Jeff Lowry Vice. 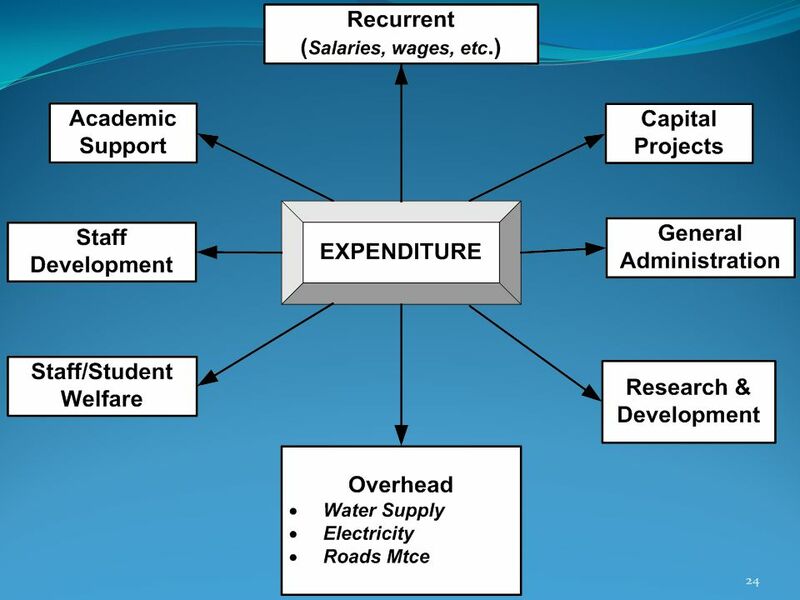 DIVISION OF REVENUE BILL VOTE 16: HIGHER EDUCATION AND TRAINING Presentation to Select Committee on Appropriations 5 March 2010. 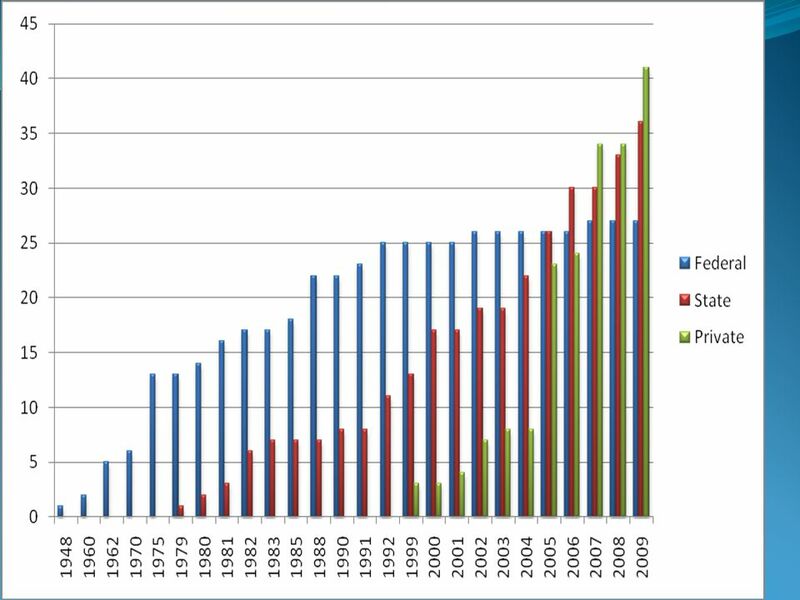 Tertiary Education and National Transformation: Challenges and Future Expectations. 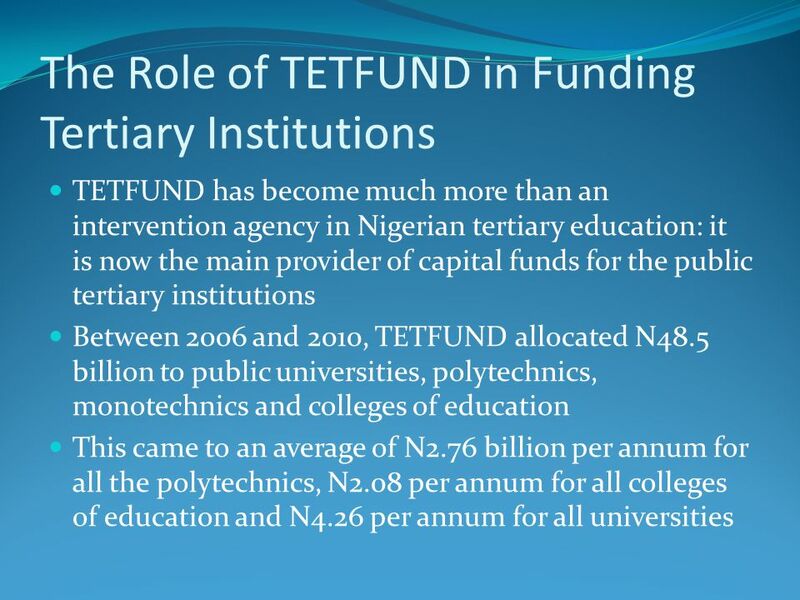 FUNDING THE EDUCATIONAL SECTOR: THE NEED FOR ORIGINAL THINKING. 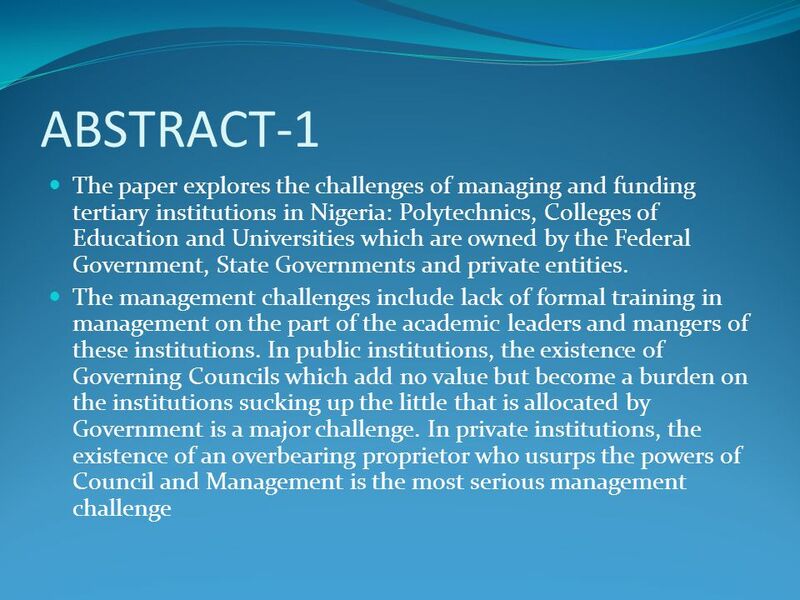 A PAPER PRESENTED AT THE 3 RD CONVOCATION OF ADEKUNLE AJASIN UNIVERSITY, AKUNGBA-AKOKO. 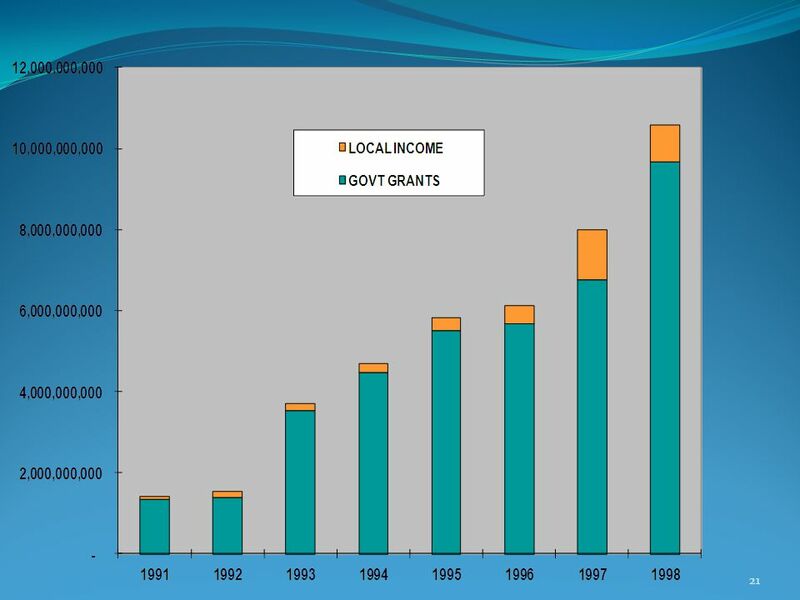 PEAM Course 2006 Infrastructure Public Expenditure Reviews Drawing on Some Recent Experiences Cecilia Briceño Garmendia AFTPI.